Day 5: This was our last day on the Hilo side - so we went to see the Kehena black sand beach just after sunrise one final time. The beach was almost empty and we spent some time in the warm blue water. It was pure bliss, but like all good things it had to end. This was the last time we would be seeing a black sand beach on this trip. After that, we went to the Akaka Falls State Park. There's a small trail that takes you through a rainforest in this park - and there's two falls on this trail. First one is the Kahuna falls, which is a cascading fall - but there's only a distant side view of the it visible from the trail. 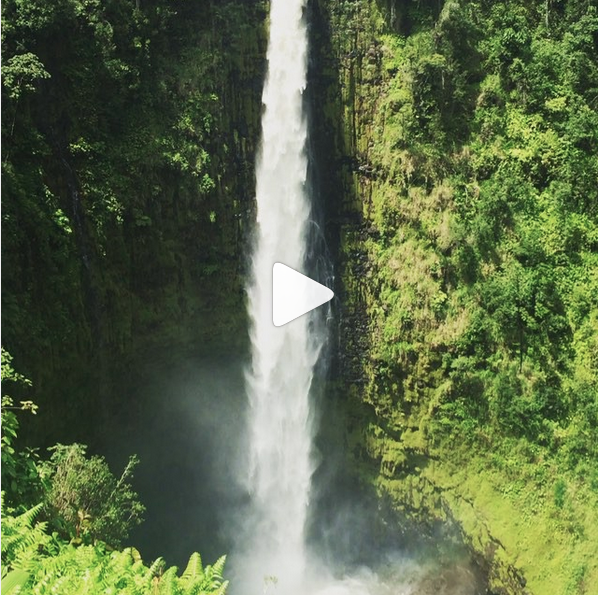 Next one is the Akaka Falls, dubbed as one of the tallest free-falling waterfalls on the Big Island. Walking on the trail, we could hear these falls before we saw them. As we gradually approached these falls, it was evident how tall they were. Here's a short video of these falls. In between the lush green rainforest, falling from such a height - these falls are super pretty. We could also see a faint rainbow at the bottom of the falls. It's great that we had this trail from where we could see these beautiful falls right in front of us. Obviously these falls are not as tall as the Hi'ilawe falls of Waipio valley - but they're much more accessible. We did want to go to the bottom of these falls (and maybe take a dip), but didn't see a way to access it without stepping out of the trail. Later we stopped at a roadside place, to drink coconut water - and we also ate some guavas. One thing - there's ton of guava trees everywhere on the Big Island. Pink guavas are most common, they're just everywhere. White guavas - somewhat rare, but still there. I also had a strawberry guava for the first time in Hawaii - which was super tasty. Our next adventure of the day was zip-lining. We booked a zip-lining tour with Skyline Eco Adventures. It was 7 zip-line rides in total, but the last ride over a huge free-falling waterfall (our guide said it was the sister falls of Akaka falls) was undoubtedly the best. That ride made this experience very memorable. Here's the video of the ride. After this, we had lunch at a nearby town - that was recommended by the zip-line crew, and then headed to Kona. The drive was long, but we were excited about going to the sunny-side of the island. We arrived at our rental just around sunset, and the view made up for everything. Sunny beaches, coconut trees and tons of fish - this was going to be our next few days.